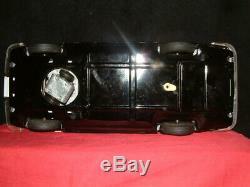 VERY VERY RARE IN EXCELLENT CONDITION A LARGE 13 DIAYA OF JAPAN OPEN TOP. 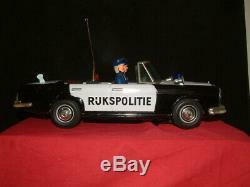 MERCEDES 250 S IN DUTCH POLICE LIVERY. 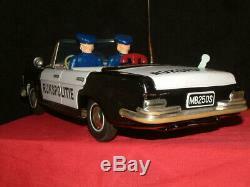 I HAVE CHECKED IT OVER WITH 2 X NEW D CELL BATTERIES AND IS IN GOOD WORKING ORDER. PAINTWORK IS VERY GOOD WITH LITTLE OR NO PLAYWEAR. THE UNDERBODY IS SPOTLESS AS IS THE ALL IMPORTANT BATTERY BOX. THE ONLY REAL FAULT IS THE MERCEDES STAR IS MISSING FROM THE BONNET AS THEY. MY ACTUAL COST NOTE UK BUYERS ONLY! 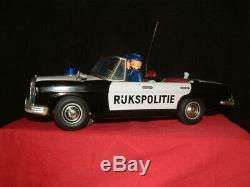 The item "VERY RARE DAIYA OF JAPAN MERCEDES BUMP & GO LARGE POLICE CAR(DUTCH EXPORT)" is in sale since Friday, March 1, 2019. 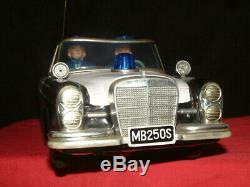 This item is in the category "Toys & Games\Vintage & Classic Toys\Tinplate/Penny Toys". 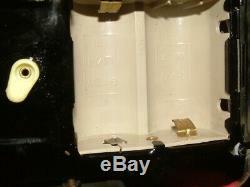 The seller is "ida387" and is located in Hinckley. This item can be shipped worldwide.